A playful sculptural intervention to complement a flood scheme strategy in the Scottish Borders. Spinning Point is a timber sculpture on the bank of the river Ettrick which is inspired by the local textile industry. From engraved woven patterns and shapes inspired by the architecture of the mills to landscaping including plants used in the dyeing of the yarn, Spinning Point has many layers of interpretation for people to discover. 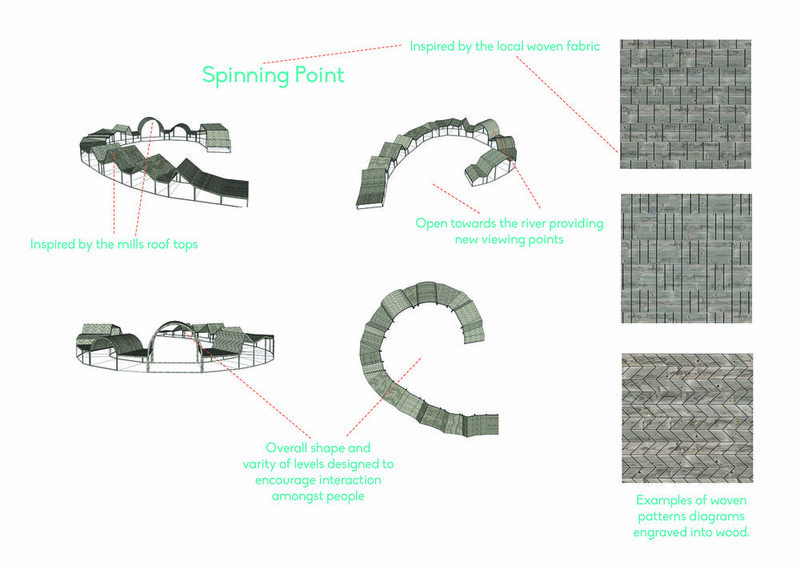 The overall shape of the piece is a circle open towards the river providing new viewing points to observe the natural environment and to encourage social interaction. Our research phase included a series of community engagement workshops with a walking group, a primary school, local dog walkers and passers by who use the site regularly. The artwork is scheduled to be installed in 2019. Timber sample created by local fabricator Real Wood Studio. Plant inspiration for the landscaping around the sculpture linking to the textile industry.